Traditionally, British hi-fi amplifiers start as integrateds, then grow up into preamplifier/power amplifier combinations as the price rises. If spending more than around £2,000, it’s not normal to buy a one-box amplifier – you’ll start to look at two. 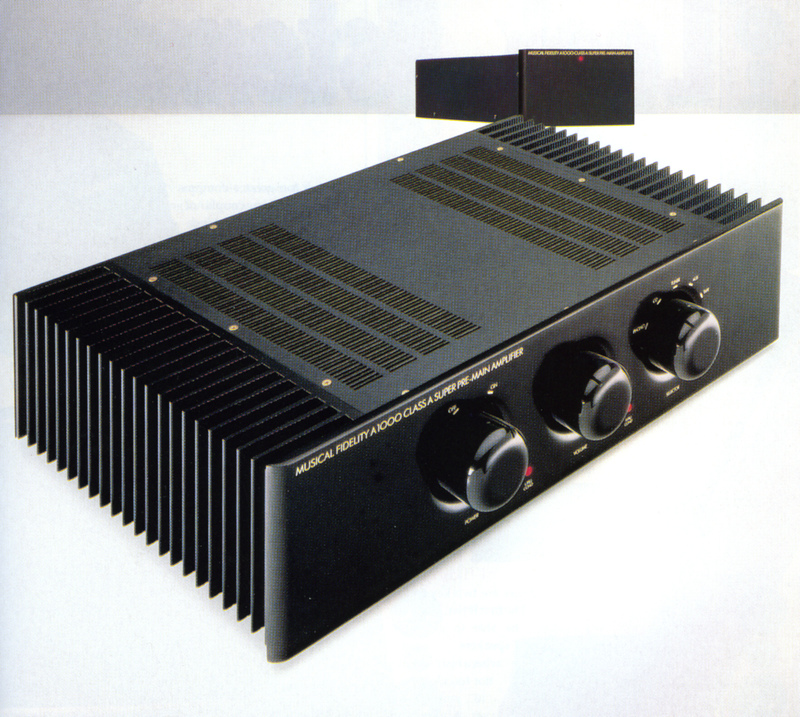 That’s why Musical Fidelity’s A1000 was something of a fish out of water when launched back in 1990. An expensive, physically large affair, it does admittedly have two boxes, but they’re split between the pre/power amp and power supply. In a way, it was one of Britain’s first ‘super integrateds’. Physically vast, and mightily heavy at over 25kg – thanks to its black gloss covered brass case – it has just three large controls (power on/off, volume and source), making it unusual for a large integrated amplifier, most of which come festooned with gadgets. The big MF put out 50W per channel (into 8 ohms) of pure Class A power, and the claim was that it would drive any loudspeaker you cared to connect to it, one not often made about such designs. Its 50A current delivery capability, helped no doubt by that big twin toroidal transformer-equipped offboard power supply, meant that this was no hollow rhetoric. Sonically it is a joy. Clean, clear, fast, crisp and lean, it is nevertheless completely devoid of the general ‘mush’ that afflicts Class AB transistor amplifiers. By the standards of its cooler running rivals, it may make a lot less power but what there is, is highly effective. Those sixteen power transistors inside the A1000 exert total control on the bass units of a loudspeaker, no matter what it is – and the result is a wonderfully precise but powerful listening experience. It’s nicely musical too, making for a very pleasing listening experience. The only criticism that could be levelled is the lack of a wide tonal palette, the big MF can sound just a little black and white by the standards of fine valve amplifiers. Oh, and don’t buy one if you’re looking to save electricity, or sit in a cool listening room! Musical Fidelity can still tweak the A1000 for the very reasonable sum of £599 including freight. The mods centre around setting it up for minimum output DC offset, replacing the decoupling capacitors for a polycarbonate/ polyester type, screening the power supply capacitors, replacing the signal path electrolytics with high grade polypropylene and upgrading the internal wiring with LC/OFC types. The sixteen output transistors are measured and matched, the choke regulation alignment is reset and some op-amps are replaced with better types. Properly modded, the A1000 becomes one of the most amazing sounding integrated amplifiers, with delicacy, clarity, warmth and colour to match its amazing speed and punch. It might not look the part anymore, but it sure still sounds it!